The rounded teardrop shaped head is forged from 1025E mild carbon steel nad has a softer heel and toe relief than many wedges on the market. 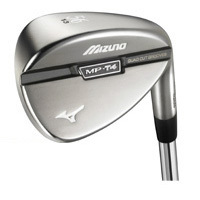 To address the fact that each different wedge is optimized for specific types of shots, whether it be a Gap, Sand or Lob wedge, the MP T4 wedge is designed to further spin and versatility through loft-specific sole geometry. It also has quad-cut grooves and specific loft geometry so you can only get the recommended bounce angle of 9.0 in the 54 degree wedge.